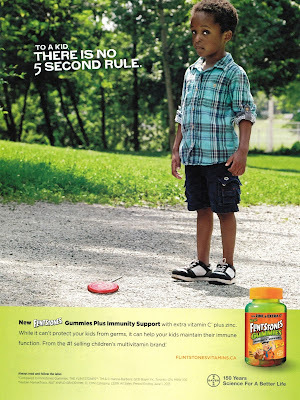 Weighty Matters: Badvertising: Do Children Need Multivitamins and Will Flintstones "Support Immunity"? Badvertising: Do Children Need Multivitamins and Will Flintstones "Support Immunity"? So to answer the first question regarding kids and whether or not they need or benefit from taking a daily multivitamin I turned to the medical literature. Simply put, I was unable to find a single study, not one, that would suggest a need or a benefit to giving a growing healthy child a multivitamin. Full stop. Now that doesn't necessarily mean that there can't be benefit, just that none has ever been proven or even suggested. So given that there are no studies proving or even suggesting benefit, how is it that multivitamin marketers are allowed to publish advertisements like the one up above (that I pulled out of a Canadian parenting magazine)? 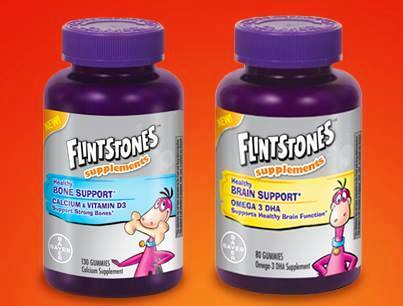 Moreover, what of the more specific claim of "Immunity Support", or if you look at the Flintstones' product line, "Brain Support", or "Bone Support"? I sure couldn't find anything to hang an evidence based hat upon. Seems to me that vitamin fortified candy (the two recommended daily tiny gummies contain 3/4 of a teaspoon of sugar) shouldn't be allowed to market itself as healthy period, let alone when there's no actual evidence base that would support the claim. But of course that's not on Flintstones and Bayer, that's on our government for allowing claims lacking in rigorous evidence to target parents who simply want the best for their children. And in case it hasn't occurred to you, I must also point out that the fact that there aren't studies on the long term use of multivitamins in children means that not only are the benefits only theoretical, so too are the vitamins' presumed safety. We simply don't know what the long term outcomes of giving growing children multivitamins and supplements on top of their regular diets might be - especially given kids' regular diets these days include an increasingly vitamin fortified food supply - and speaking personally, that's not a science experiment I'm willing to sign my children up for.